The Nili Fossae region of Mars is one of the largest exposures of clay minerals discovered by the OMEGA spectrometer on Mars Express and mapped in greater detail by the CRISM spectrometer on MRO (see the gallery). 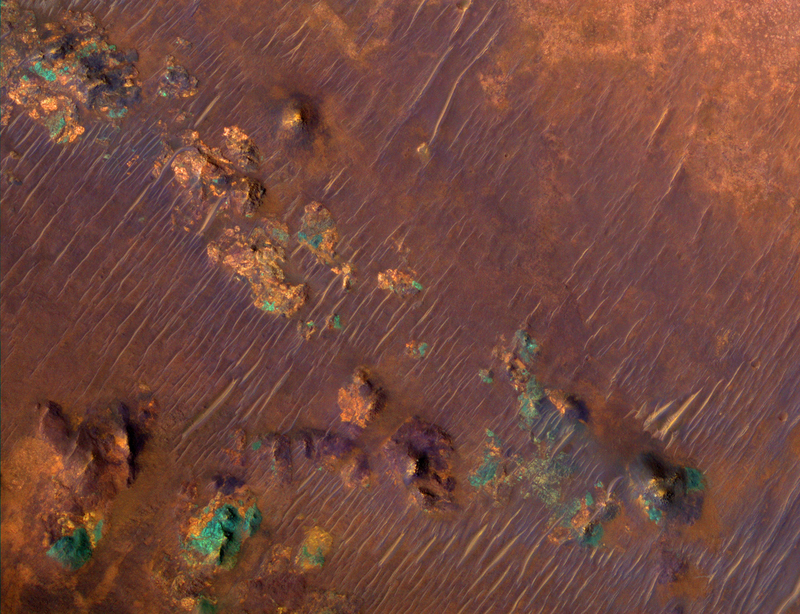 In the HiRISE IRB color, dark blue regions are basaltic in composition, including sand-sized material that bounces around in the wind to form dunes. Basalt in the most common type of volcanic rock on the Earth and other terrestrial planets. 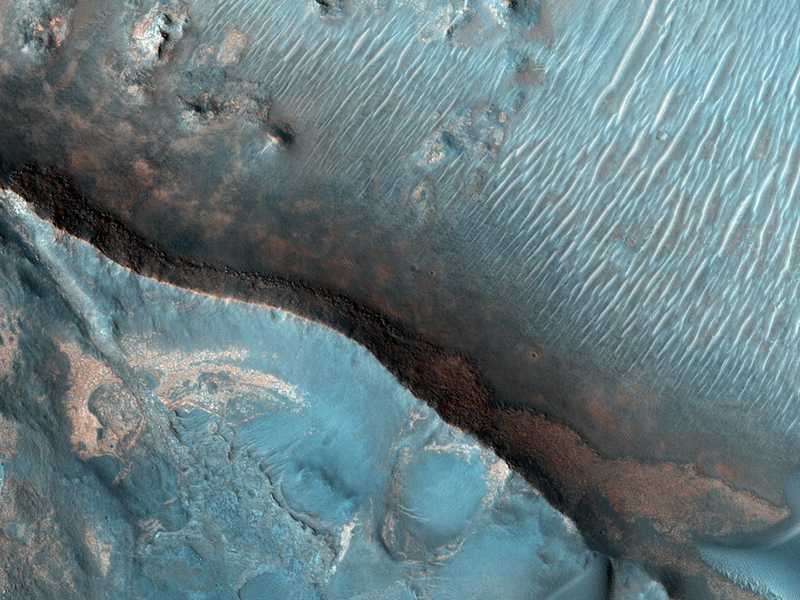 The light-toned areas (with a variety of colors) and covered by small-scale fractures is the clay-rich material. Clay minerals contain hydrogen and oxygen (i.e., water) within their mineral structure, and may also preserve organic materials, so there is great interest in studying these deposits to understand past environments that could have supported life. We are also releasing a video produced by the digital animation group at JPL, scrolling from south to north over this image, as a simulation of the view from the MRO spacecraft.The colors have been specially enhanced for this video, beyond the standard enhancements applied to all HiRISE color images. A sample of the enhanced color is shown here; the purple areas are basaltic materials, orange areas are rich in clays, and the blue-green patches are outcops of unaltered rocks rich in the mineral pyroxene. This would be a wonderful place for detailed exploration by a rover like MSL. This is a stereo pair with PSP_003587_2015.